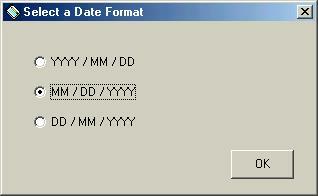 Selecting Date Format from the Options menu on the main screen brings up the entry panel above. Three possible formats for dates are provided to satisfy different regional tastes. This will affect how dates are presented on the main views throughout the program.